In order to help its customers dive into their data lakes and go insight fishing, EMC has updated its Isilon OneFS software and added a 60-slot high storage density box. 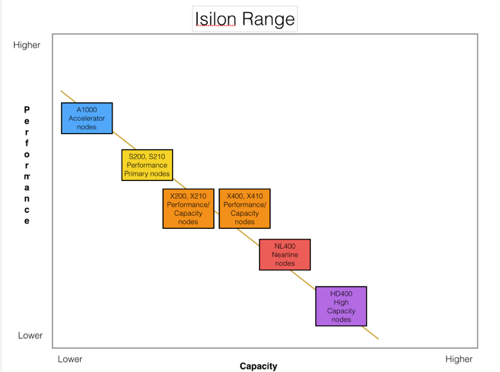 The Isilon range of scale-out filers run the OneFS operating system and comprises A100 accelerator nodes, S200 and S210 performance-optimised primary storage nodes, balanced X-series performance/capacity nodes, NL400 nodes for nearline storage, and now the capacity-optimised HD400. The NL400 stores up to 210TB of data per node. The HD400 – said to be for “deep archives”, disaster recovery and data lakes – has 60 disk drive slots and holds up to 354TB, implying 5.75TB drives. A rackful of HD400s holds 3.2PB by the way. A cluster of X400s holds slightly more than 20PB. HD400 clusters range from 1.06PB to 50.9PB and Isilon clusters can hold a mix of the various node types. The OneFS software supports NFS, SMB, HTTP, OpenStack Swift object access, and HDFS (native). EMC says this means you can combine structured and unstructured storage in the same cluster. The settable three-drive failure protection option is described as +3d:1n1d (3 drives or 1 node and 1 drive) and keeps HD400 node pool data safe if three drives fail at the same time, or one drive and one node fail simultaneously. We can look forward to HD400 updates to support 8TB drives and then, potentially, 10TB drives in due course, with cluster capacity rising proportionally. All this capacity should enable Isilon to withstand competition from IBM's GPFS, sorry; Elastic Storage; no, sorry again, Spectrum Scale (get it right - Ed), Ceph and Gluster.